The Pele pendant light by Tech Lighting features a contemporary mid-century modern-inspired design. With its funneled glass detail and perfectly spherical design the Pele pedant provides an ample amount of omnidirectional illumination. 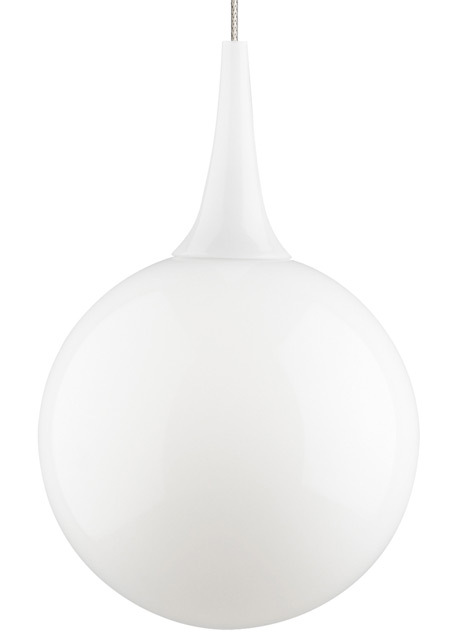 Scaling at 10” in length and 6.5” in diameter this moderately size pendant makes it ideal for kitchen island task lighting, bedroom lighting and bath lighting flanking a vanity. The Pele ships with your choice of either halogen or LED lamping, both options are fully dimmable to create the desired ambiance in your special space. For even greater design customization pair the Pele with the Kable Lite or Monorail system by Tech Lighting. Includes low-voltage, 50 watt frosted halogen bi-pin lamp or 8 watt, 300 delivered lumen, 3000K, replaceable SORAA® LED module and six feet of field-cuttable cable. Dimmable with low-voltage electronic or magnetic dimmer (based on transformer).